Tired of the hectic city life? 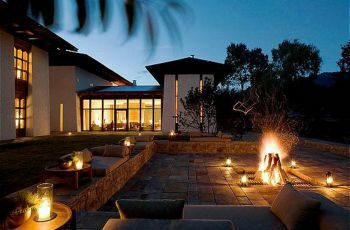 Here is your chance to enjoy the serenity and carefree luxury of the pinewoods. And the best part of it is that this ultimate escape is just a stone’s throw from the capital city. Wangchuk Resort is an extension of the pristine forest set in best of Bhutan’s traditional intimacy with the environment while the service keeps abreast with the best in the business. 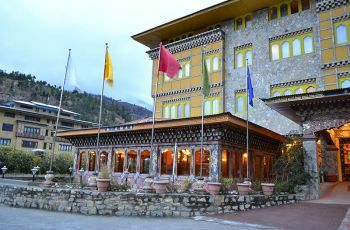 best of Bhutan’s traditional intimacy with the environment while the service keeps abreast with the best in the business. 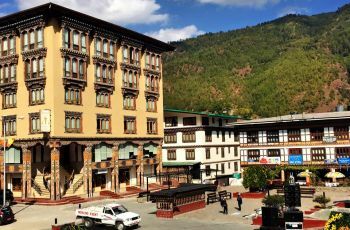 Rise to the chirping of numerous species of rare birds and espy through lush pine forests stunning views of the seat of Bhutan’s capital, Tashichhodzong, the Parliament building and all of Thimphu valley. **A special feature of Wangchuk Resort is the opportunity to re-discover your inner self through spiritual quest. In an atmosphere of unobtrusive tranquility, you can either meditate at will or listen to discourses from highly learned Buddhist Masters. A beautiful Lhakhang(Temple), the Layrab Choling Goenpa, at the resort will further your quest for peace. Child below 6yrs-12 years can share existing bed with parents but meals will be charged 50% of above meal rates. Child below 6yrs can share existing bed with parents without any cost for rooms & meals.